Sand art is the practice of modelling sand into an artistic form, such as a sand brushing, sand sculpture, sandpainting, or sand bottles. 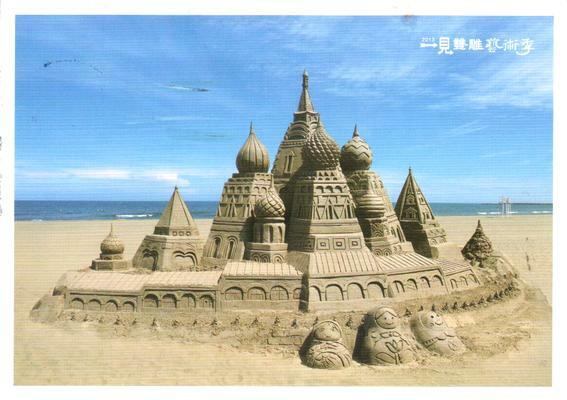 A sand castle is a type of sand sculpture resembling a miniature building, often a castle. The two basic building ingredients, sand and water, are available in abundance on a sandy beach, so most sand play takes place there, or in a sandpit. Tidal beaches generally have sand that limits height and structure because of the shape of the sand grains. Good sculpture sand is somewhat dirty, having silt and clay that helps lock the irregular-shaped sand grains together.